Involuntary Smiles: Do as I say, not as I do. Ah, geeze, you guys. I am feeling smiley all over! Over the last little while I have received quite a few awards, and though I don't post them (I am trying to de clutter both my blog and my house) I really am truly tickled, and need to thank the award givers. Because when someone gives me an award, it tells me that people other than my mother are interested in what I have to say about my life. And that just feels good! So, a big thank you to Tori, Emmy, Mub, Tiffany Valentine, and Jingle for the bloggy love you have sent me. 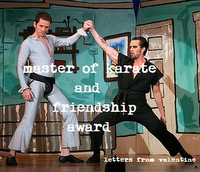 To start off with, Valentine from Letters from Valentine gave me the Master of Karate and Friendship Award. She made this award, and proclaims it as totally fetch. I would have to agree with that statement, as it is so aptly put. I mean really, have you seen it? It is so kick awesome, and I am so excited I grunt with delight (as karate masters never squeal. Just grunt). The rules to the Master of Karate and Friendship award are to list 6 things you are master in, and then pass it on to 6 people who are masters at friendship and make blogging awesome. I am not going to do that. Sorry Valentine. The truth of the matter is, I had a way awesome post written that took me a couple of hours and a whole lot of linking to people. I hit the publish button, and it was all deleted. Very annoyed. Very. And when I checked in my drafts, only about an eighth of it had been saved. I don't know what is going on with Blogger right now, but I am not amused. So, if you are visiting my blog, go ahead and take an award. I am too tired and busy to go through and re-do the whole thing. Sorry about that. Just blame Blogger. But I will list the rules I am breaking so you can not follow my bad example, and actually pass them on the right way. 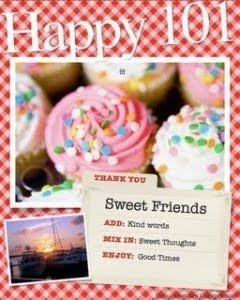 Link to the person who gave it to you, list 10 things that make you happy, pass it on to ten people. Or, list 7 things people don't know about you, and pass it on to seven people. Link to the giver of the award, pass it on to 12 people, with their links on your blog. There were no rules with this one, but I was passing it on to five people I think. So, I was passing on 35 or so awards. Chances are if you read my blog you got one. So just pick one of your liking, and pass on the love. And not my example of completely cheating. I have a good reason. Darcy (my computer) and I are fighting right now. Congrats on your awards! Declutter - it is good for you! :o* (i'm terrible at reposting awards!) thanks for sharin' the love! Congrats on all the awards, you totally deserve them! :) Hope you had a great weekend! I love that you named your computer Darcy. Thanks, Amy! 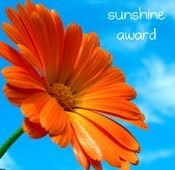 I linked to you today with the sunshine award!! Thanks for the comment and the award! Which one did you want me to have, I can't pick my own, lol! W. is adorable! And so is her love for Zachery! However, I am totally in for it when there older, lol! Congrats to you...and I guess, congrats to me too! Thanks! Congrats on so many great awards, and hope your computer starts behaving. Blogger makes me ornery more times than I can count. Oh well. Congrats on all the awards!! 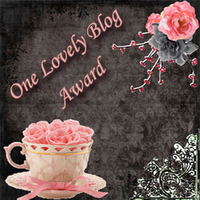 I'm totally snagging the lovely blog award... I like the tea cup and roses! Amy, I did not mean to hurt anyone when I write the post for another Amy, in fact, your place is cool and beautiful too, I simply wishing you well, never meant to hurt or discourage anyone. u are beautiful in your own way! I admire your courage and open mind. May I take the Happy 101 please? I will publish it and honor u next week, maybe Monday! love your kindness and instant feedback!